Your mission: A better way to manage licensing. Like other regulated professions, security companies and their staff require a unique combination of education, experience, and other qualifications that vary in every state. Most states impose licensing requirements on individuals as well as the company overall. Adhering to professional licensing requirements is key to maintaining your legal authority to provide security services. Since requirements vary widely from state to state, it’s important to research the requirements before providing services in any state. In addition to being required by law, being fully licensed reassures your clients and demonstrates your commitment to high professional standards. 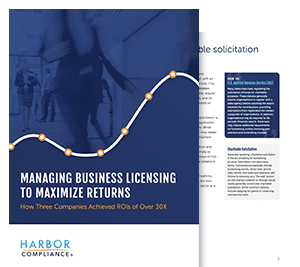 Harbor Compliance can help you maintain licenses wherever you plan to do business. Contact us today and leave the frustration and paperwork of meeting state requirements to our compliance specialists. The following guide contains an overview of licensing and specific board requirements in each state. Learn more about the requirements for individual private investigator licensing in each state and what you can do to meet them. In many states, private investigation agencies must register with state authorities before providing services. Firearm Qualification - An additional qualification attached to license applications for armed private investigators. Private Investigator Apprentice - Apprentices are issued limited licenses and can only operate under the direction of a licensed investigator. Qualified Representative - A licensed private investigator who is responsible for the operation and management of an investigative agency. Reciprocity - When a private investigator is allowed to do business in a different state under the license issued by their home state. Industry association that sponsors education and certification efforts for members. Private investigation and security advocacy group. Industry association focused on education and certification.